It's time to love your lawn again. 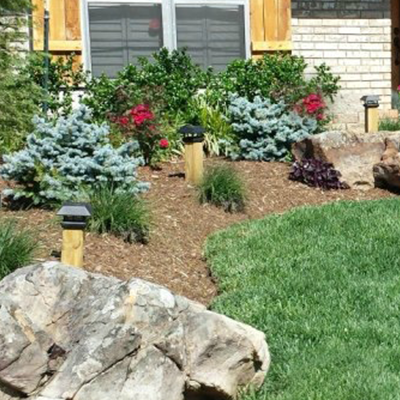 Tús Nua Lawn & Landscape offers a variety of different styles of landscaping. We understand that having landscaping installed is no small decision. Let us make things as easy as possible for you and schedule a consultation today. Tús Nua Lawn & Landscape has serviced hundreds of satisfied residential customers. Residential services make up half of our business and it is our biggest priority to make sure our customers remain pleased. For routine lawn maintenance we offer weed treatments and fertilization along with routine lawn mowing services. All crews speak 100% English. For landscaping services we make your dreams a reality. We work within your budget and make it as hassle free as possible. Most landscapes are done in 2 to 3 days. For residential properties we service the Oklahoma City Metro, Edmond, Mustang, Yukon, Moore, and Norman. For estimates or more information about residential services please fill out our form or call (405) 313-4929 and we will get back with you as soon as possible. This most commonly installed landscape is best suited for newer style homes that want that “wow” factor. Customers requesting this style of landscape usually do not like the basic low-budget landscapes commonly installed by the home builder. The Estate Package is our elite line of landscaping. These custom landscapes are made to fit the scale and style of the home. Styles range from conservative to extravagant and will always add impressive curb appeal to your estate. We start with a consultation to make sure that through our detailed planning process every aspect of the customer’s vision is included. This package typically includes all new landscaping (front, side, back), mature plants and often outdoor lighting. These landscapes will give your estate a well defined look while adding significant value to your home. Not sure what you want or what you have in mind isn’t described here? No worries. We can customize a landscape plan for your home. We can create low-maintenance, modern, or traditional landscapes, water features, and even privacy barriers. If this is more like the type of landscaping that fits you please let us know and we will schedule a free consultation. Email us or give us a call (405) 313-4929 and we will arrange a meeting to discuss your vision. We make holiday fantasies come to life! We offer several different packages and can store your lights at our facility freeing up space in your home and eliminating the yearly hassle. The holidays bring unnecessary pressure for you and your family. It is our goal to make lighting your home as hassle free as possible. Just tell us what you desire and we will handle it for you. We will have your lights up by Thanksgiving and have them taken down shortly after January 1st. For a free estimate or consultation please contact us and we will be happy to meet with you! Fill out our form or give us a call!